I don't know what these beautiful flowers are called. I only know that I like them. Taken with my iPhone. I hope you are happy in Seattle, dear Bella. looks like Helleborus foetidus, a winter bloomer. How are you doing up north? Beautiful flowers, I'm rather fond of them too. So interesting-looking...& quite a beauty too!! I love looking at flowers from inside my house because I am terrrrrified of wasps. And bees. Anything that flies, really. It's a beautiful photography...no matter what flower it is. Those flowers are so cool! They're camouflaged as weeds I think. Very pretty. I wish my aunt was still here, I would have shown her. She knows all plants and flowers by their scientific and common names. cray cray. It IS a pretty flower...I tend to lean towards different things I have no idea what they are too, lol...maybe it makes us like them even more? Hope your finding your bliss in Seattle. 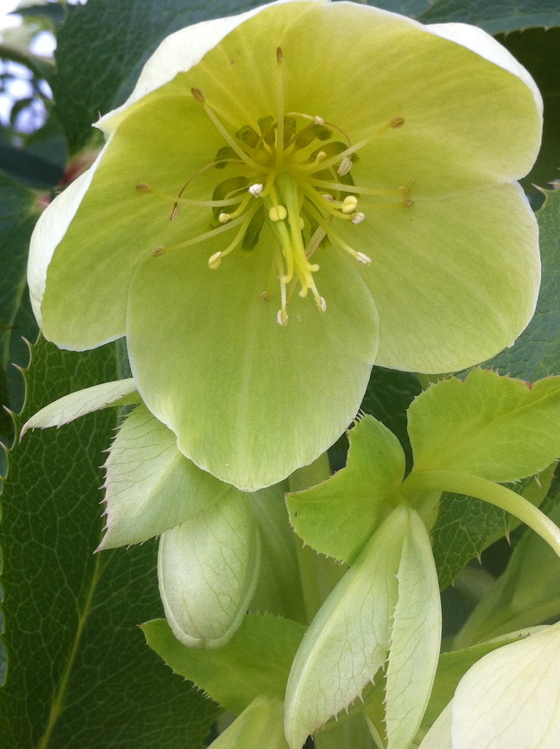 I believe that is a Helleborus. They come in a few enchanting shades. One of my favorite parts about Seattle spring is all the pale green. Some of it is more neon than pale, but lovely nonetheless.